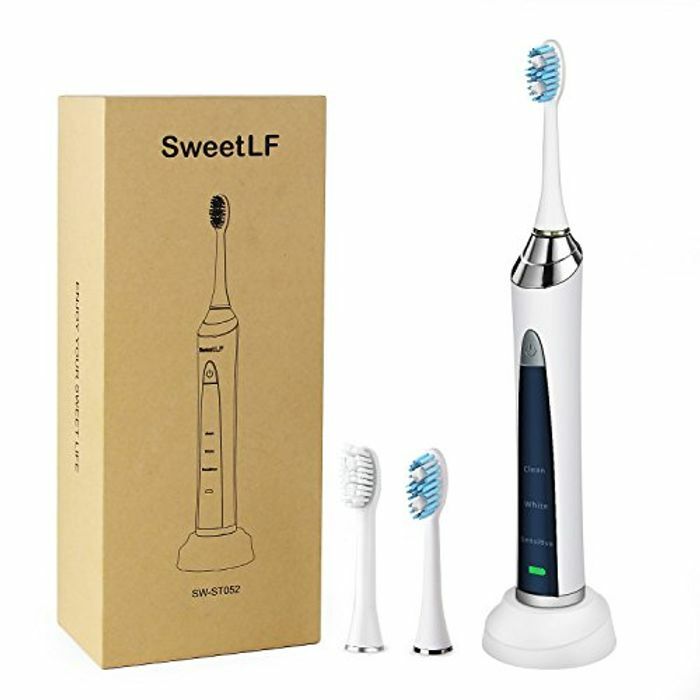 SweetLF Electric Toothbrush - Just £13.38 from Amazon! Redeem the promotion or use code: TLJ7YTDJ to get 50% off making this just £13.38...RRP £79.99! 3 MODES: Sensitive, Clean and White 3 modes. Your teeth will be 2x whiter in just 2 weeks with WHITE mode compared to a MANUAL method. AUTO-TIMING: 2 minutes per time ( a slight pause every 30 seconds to remind you to change brush area ) . SONIC TECHNOLOGY & WATER PROOF: brush movements up to 48,000 per minute, IPX7 waterproof. 3 BRUSH HEADS: 1 standard configuration and 2 replacements, 3 months life time per brush head, need not to buy a replacement at least 9 months.